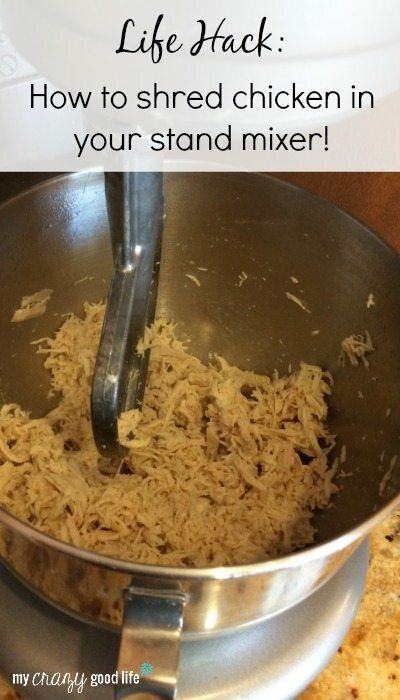 As I was preparing chicken tacos the other night, a friend asked me what I was doing when I put the cooked chicken into my Kitchenaid stand mixer bowl. When I told her I was just shredding it quickly, she was amazed. You can shred chicken in your mixer? Yes! It takes just a few seconds, and is so much easier than pulling it apart with two forks. I wish I had a long fancy sounding description of what I do, but I literally just put it in my mixer and turn it on! I know this is a simple post–basic. But I just learned about this trick last year and want to make sure you all know about it, as well! 2. Put the chicken in your stand mixer bowl. 3. Insert the flat beater attachment. 4. Turn your mixer on low. 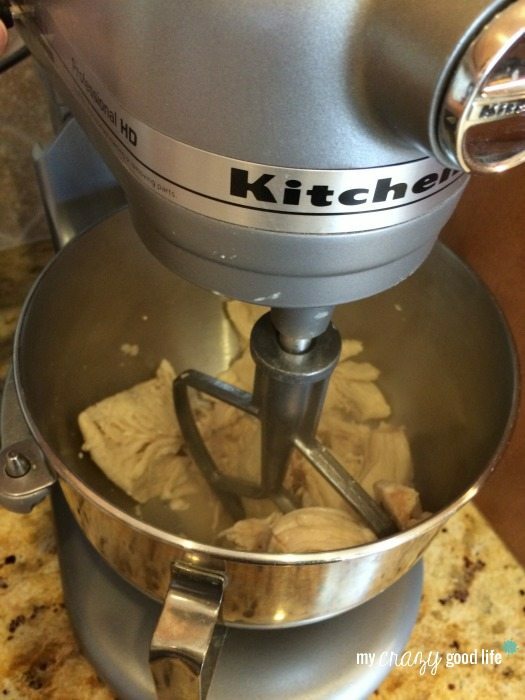 Stand near your mixer–it goes from whole to shredded to ground pretty quick, and ground chicken isn’t something I like to put into enchiladas, burritos, or other recipes. Do you have another good way to shred chicken? I want to know what it is! Please leave a comment below and let me know what you do. Where has this idea been all my life?!? So do I need to add a little bit of liquid in there to help with the shredding process? Nothing! Just add the chicken and mix! I’ve added sauces when making enchiladas and such, and I’ve noticed that takes a little longer to shred that way. Shut. The. Front. Door!! I’ve been forking, but I’ll be mixing now :) I can’t wait to freak my family out with the mixer while making Chicken Tacos. Seriously! I was so excited when I learned about this!